Now this is what I'd call a food trip! Right after having kaya toast and cupcakes at Chin Mee Chin Confectionery, we literally hopped next next door to 328 Katong Laksa as this has been one of the places friends have been recommending to us. Every time we'd tell someone that we haven't been to East Coast, the first thing they'd say is: "What?! But the laksa is the best there!" That said, we agreed not to pass up the chance to have that much raved about Laksa for this trip. To be honest, I rarely have Laksa simply because I always thought it was unbearably spicy. Sweating profusely while eating is not really something that I really like to do. Well, the restaurant has a nice air-conditioned area inside so at least they got that sweating problem covered. Now, we will have to see if the spice level of the Laksa is something we can manage. We got a small bowl of Laksa (S$5) to share. Look at that generous serving of shrimps, noodles, cockles, fish cake and bean sprouts! I love how they have cut up the noodles that there's actually no need for chopsticks and you can easily slurp up this noodle soup with a soup spoon. As for the spice level, I'm happy to report that it just had a very mild kick. Of course, we didn't add any more chili so the soup stock itself was very milky with a hint of spicy note in the end. It was actually very good that for a moment there, Paul and I wished that we got the large bowl (S$7) instead. Well, perhaps next time, we're getting our own individual bowls to have more Laksa noodles to ourselves. Researching more about 328 Katong Laksa, I'm so relieved that they actually have 6 branches all over Singapore and 3 of which are in the west! Yahooo! Looks like this will be the start of more Laksa bowls to consume. Here's another trivia, did you know that Gordon Ramsay once challenged the owner for a hawker cook-off challenge and 328 Katong Laksa won over the famous TV chef! I'd say though that no one knows true authentic Singaporean food than the local Singaporean chefs themselves. Hats off to them. 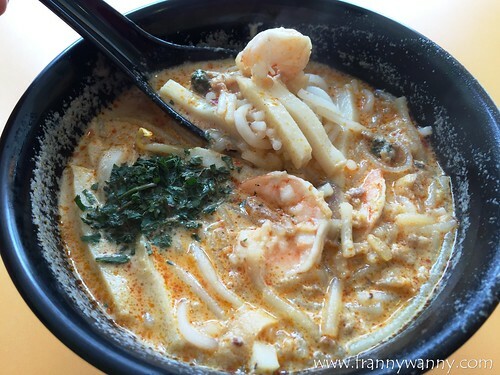 328 Katong Laksa is located at 216/218 East Coast Road, Singapore. Click here to see the full list of branches.